The wild machine you see before you is a product of Rinspeed, a Swiss auto manufacturer and tuner known for its innovative (if not zany) concept cars. 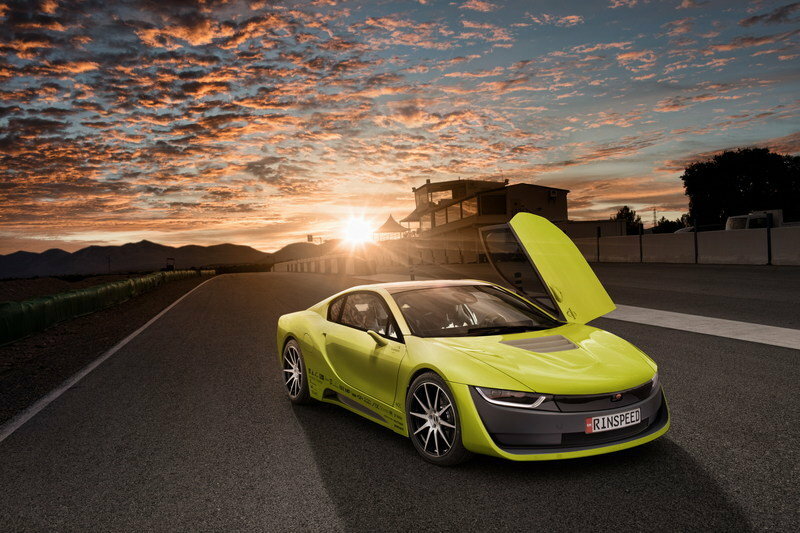 It’s called the Etos, and it started life as a BMW i8 – currently one of the most advanced platforms in production. Upping the ante is a sci-fi novel’s worth of future tech, including fully autonomous capabilities and a rear-mounted drone. 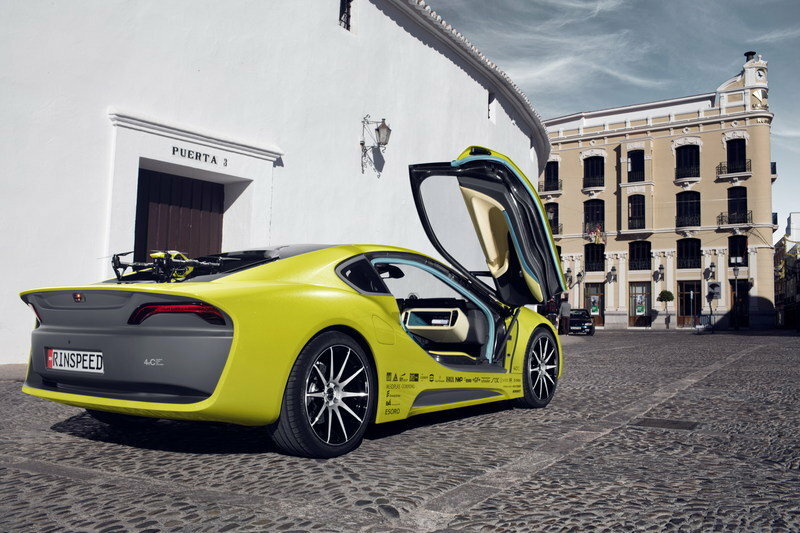 It’s a vision of things to come, and you’ll find it first right here in the U.S.
That’s because the Etos will make its global debut at the 2016 Consumer Electronics Show (CES) in Las Vegas, a fitting venue for a self-driving, drone-wielding hybrid sports car. “The major and especially the disruptive innovations in future automotive engineering will come from the digital realm,” says Rinspeed boss Frank M. Rinderknecht. The man has a point, especially when you consider the automotive slant CES has adopted over the past several years. All told, the Etos is overflowing with ideas about the future of personal transportation. Read on for a deeper look at this four-wheeled crystal ball. Continue reading to learn more about the Rinspeed Etos Concept. If you’re at all familiar with the BMW i8, the Etos shouldn’t look completely unfamiliar. The stance is still low and wide, the doors still open up instead of out, and the headlights appear unchanged. However, the front fascia is restyled to look smoother and less cluttered, a motif that carries through the side skirt lines. The rear fascia is also flatter and evened out, and the rear deck juts out in dramatic fashion (more on that in a minute). The Etos’ elongated tail provides the drone with a landing pad outfitted with 12,000 LEDs. The paint is a simplified two-tone, mixing flat black with what appears to be Austin Yellow Metallic (a production BMW color). In the corners are 20-inch Borbet GTX wheels, which were made from aluminum and use titanium for a protective edge. Rinspeed also says it used “innovative surface finishes” for the body panels, including specialty ceramics and metal alloys that provide a unique look and feel. Finally, there are octagonal antennas integrated into the roof for a slick appearance and exceptional wireless connectivity. Now for the weirdest (coolest?) 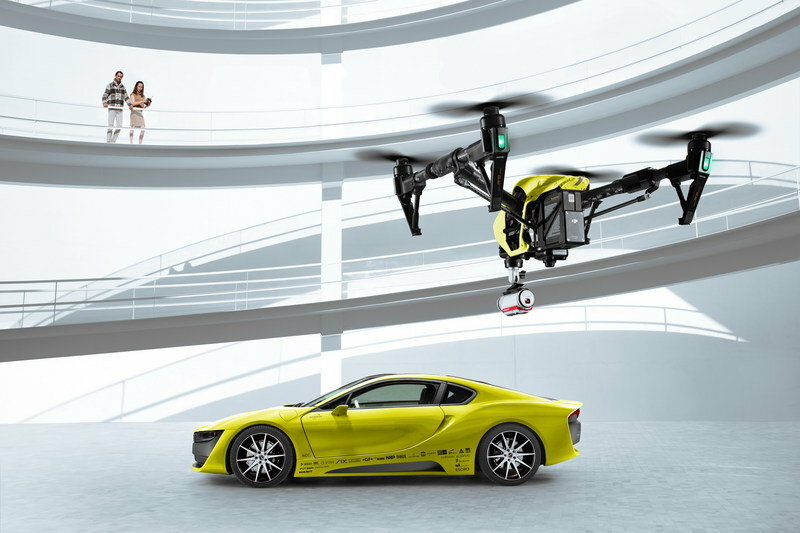 exterior feature of the whole concept – the onboard drone. Perched out back is an unmanned aerial vehicle (a quadcopter, to be exact) from Chinese technology company DJI. The Etos’ elongated tail provides the drone with a landing pad outfitted with 12,000 LEDs. That means the pad can project whatever imagery you’d like, be it messages, or visuals for a tiny dance-off competition. The pad is made from “Gorilla” glass, the same stuff used on smartphones, and the lightweight material also extends into the roof. 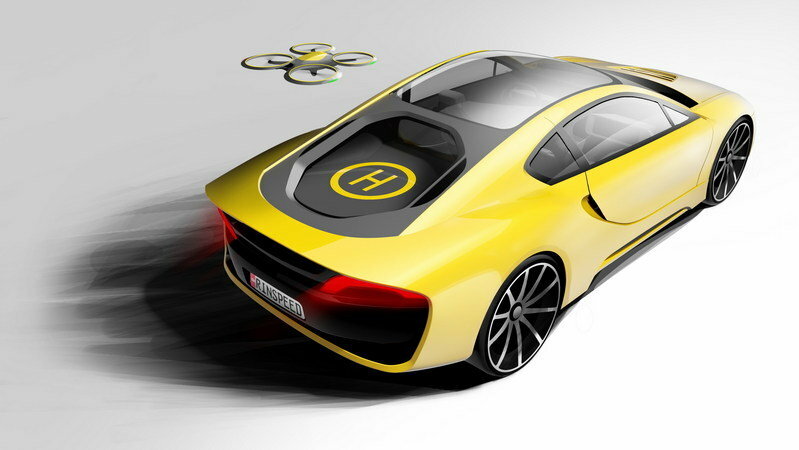 So then – a drone for a car. Why, you may ask? Rinspeed says it can be used to do stuff like pick up a bouquet of flowers and deliver it to its intended recipient, or stream a live feed of the sports car tackling a windy road. Believe it or not, this actually isn’t the first time I’ve seen a drone integrated with a car. That honor goes to the 2014 Renault Kwid concept, which proposed using a UAV to do stuff like check out the source of congestion when stuck in traffic jams. Inside the Etos concept, the i8’s bones show through most prominently in the central tunnel and door panels, but it doesn’t really matter as soon as you see the dash. Replacing the stock BMW piece is an eccentric symmetrical layout, and mounted just below the windscreen are two individually adjustable, curved, 21.5-inch ultra HD widescreen monitors. There’s also a Swiss clock featured high and center, appropriately tying together the new and old school (mounted in the clock support is a camera for video conference calls). Embroidered on the seats is the San Francisco skyline as homage to the Bay Area’s plethora of tech-oriented businesses. The pedals are titanium, while the upholstery features leather. Embroidered on the seats is the San Francisco skyline, no doubt as homage to the Bay Area’s plethora of tech-oriented businesses. A variety of functions are remotely controllable via either a smartphone or smartwatch, while voice command, gesture control, touch screens, and hard buttons are all in place when you’re actually sitting in the thing. Mounted to the exterior are eight HD cameras that provide a real-time view of the car’s surroundings, effectively eliminating blind spots. The cameras are also able to identify potential hazards, like people, objects, and curbs. Finally, gaze-tracking software can pick out what the driver has and has not seen, providing customized warning messages when appropriate. Other tech includes onboard radar, car-to-x connectivity, wireless cellphone charging, and wireless parking toll payments. Harman Connected Car technology was called upon for infotainment, providing navigation, points of interest, refueling opportunities, hands-free calling, music, and video as directed. However, there’s a twist – Rinspeed says the system will learn as you use it, offering up customized options once it has a flavor for your predilections. Creepy? No doubt. But it should reduce the distraction of manually entering selections once it understands what you want before you even ask. Speaking of intelligent technology, the Etos is capable of fully autonomous driving. Simply put it into “automatic pilot” mode, and the steering wheel folds up and retreats into the dash, allowing the driver to concentrate on other things (Rinspeed suggests reading a book). Capabilities like this rely on a huge amount of data to function properly, and the Etos connects to the larger transportation grid (traffic signals, traffic management, emergency response, etc.) 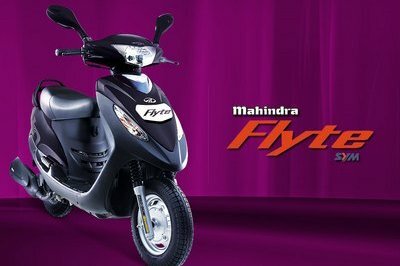 to ferry around its passengers worry-free. All this connectivity also means the Etos can do stuff like find an open parking space in a crowded urban environment, and provide passengers with 3D navigation info, pointing out recognizable waypoints like buildings and even trees for easy direction-finding. While Rinspeed when to great lengths to pack in the tech for the Etos’ exterior and interior, it left the drivetrain untouched. That means motivation comes from the stock i8’s turbocharged, 1.5-liter three-cylinder and two electric motors, which combine to create 356 horsepower and 420 pound-feet of torque. Unsurprisingly, I would have been delighted to see more output, but as is, the i8’s drivetrain is still pretty amazing. However, I can’t help but think an all-electric drivetrain would be more appropriate if we’re looking this far into the future. Additionally, Rinspeed appears to be ignoring the extra heft the new technology would add to the curb weight. But that’s not a big deal. Rinspeed is obviously more concerned with human-machine interaction, and in that respect, there’s plenty on offer. Ever seen someone read a book while getting whisked around a racetrack in a self-driving car? Of course you haven’t. No one has. But that’s the kind of weirdness the Etos brings to the table. Does this Rinspeed concept make sense? Yes and no. The self-driving features are an inevitability we’ll all need to embrace sooner or later. As for the drone, well, I’ll just classify that under “miscellaneous extra” – for now, at least. But that’s exactly what a concept should be. It’s supposed to present ideas for the future, not the present, and who knows – maybe when the computers are driving us all around, we’ll need that drone to keep us occupied. 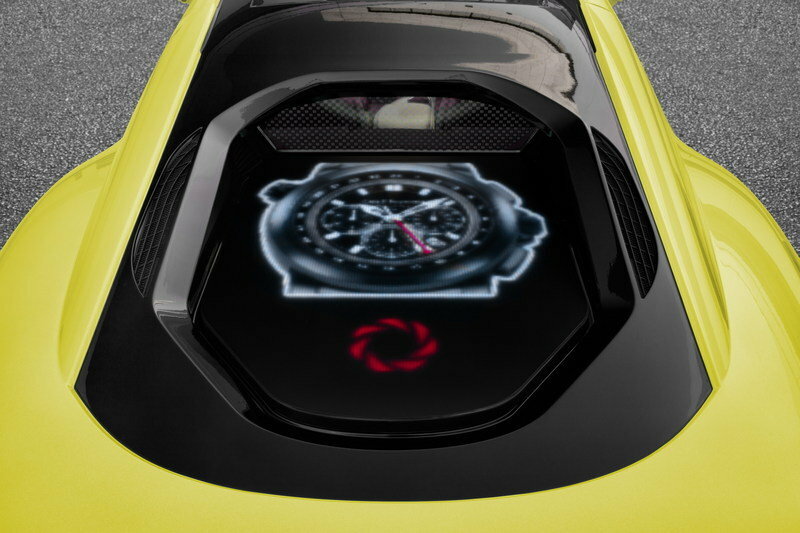 The Rinspeed Etos concept will be shown at the Consumer Electronics Show between January 5th and 8th. After appearing in Las Vegas, the Etos will head home for its European premiere at the Geneva Motor Show on March 1st. The Swiss progressive thinker approached the mega topic of “driverless cars” largely from the point of view of drivers and passengers, and has generated a number of equally inspiring and emotional ideas. They include an intuitive, adaptive autopilot capable of learning. The resulting and much-debated question “How much man should, must or may be in a machineΣ” will be discussed for a long time. 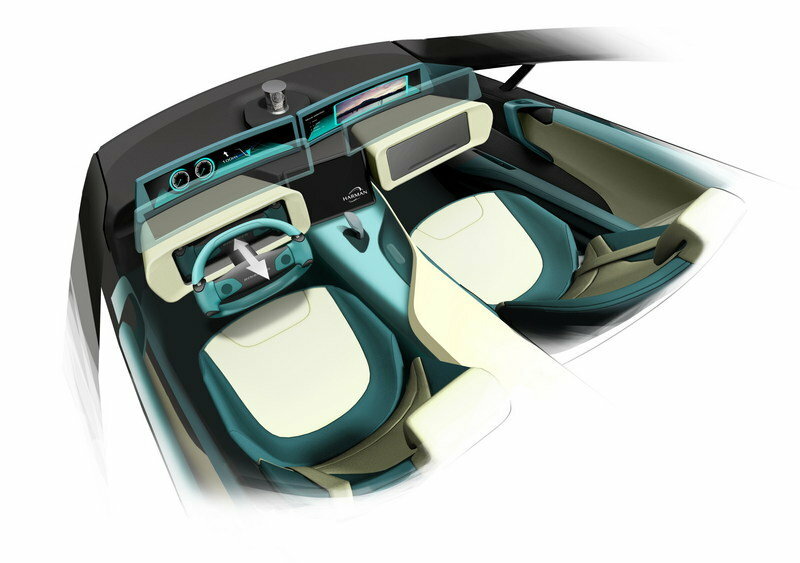 To provide the passengers with a unique infotainment experience, the Rinspeed „Σtos“ uses the innovative Harman Connected Car technologies. Just like a personal assistant, the system operates in a thinking, courteous and anticipatory manner. In addition, it delivers perfect entertainment, connectivity and maximum safety. No doubt, Frank M. Rinderknecht presents himself as a visionary and magician in Las Vegas. 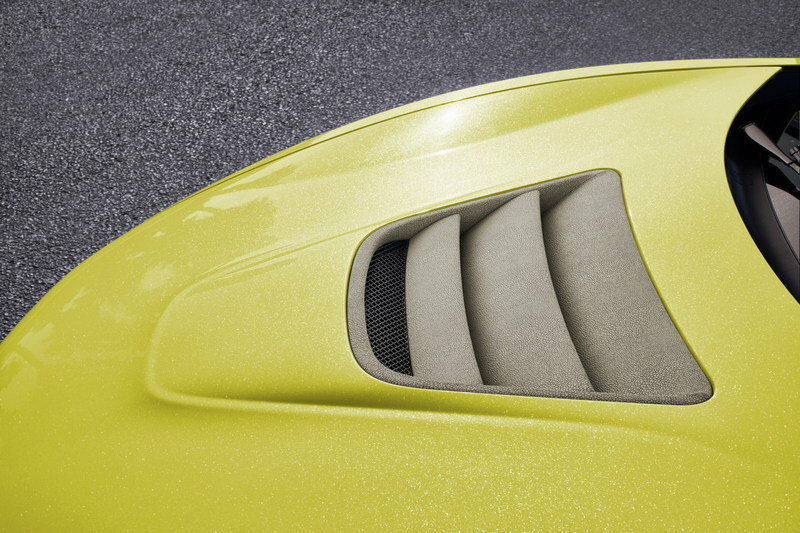 And, because a great show also definitely requires extraordinary head-turning packaging, the Swiss national opted to use special innovative surface finishes in the „Σtos“ that are still completely alien to car designers. Touch it, feel it - it’s magic!